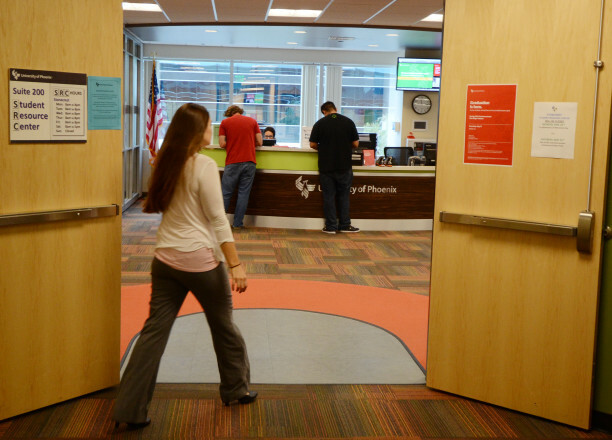 A student enters the student resource center at the University of Phoenix's San Diego campus. The Pentagon has indefinitely suspended the chain of for-profit schools from receiving new money from the Defense Department’s tuition assistance programs. Veterans groups today urged the U.S. Department of Veterans Affairs to follow the Defense Department’s lead in stemming the flow of federal education funds to the University of Phoenix, which was placed on probation this week by the Pentagon after an investigation into Reveal’s exposé on the for-profit school’s recruiting practices. The Pentagon has barred the university from recruiting at military installations and indefinitely suspended the school from receiving new money from the Defense Department’s tuition assistance programs. Veterans groups and members of Congress applauded the action but want the Pentagon and VA to do more to defend military personnel and veterans against predatory recruiting practices. They called on the VA to conduct its own investigation. “The DOD has taken action, and the VA has not. The VA hasn’t stepped up yet, as far as we know, to enforce its own rules on this matter,” said Carrie Wofford, president of Veterans Education Success, a Washington-based nonprofit that aims to protect veterans from being taken advantage of by for-profit colleges. Iraq and Afghanistan Veterans of America added its voice, saying the VA should restrict the amount of money the University of Phoenix receives through the GI Bill – in the face of growing concerns over the school’s recruiting tactics. Since 2009, the school has received more than $1.2 billion in GI Bill money. Last year alone, it received $345 million to educate Iraq and Afghanistan veterans, along with $20 million in tuition assistance from the Pentagon. In a statement, the VA said the Pentagon’s actions “do not have an immediate effect” on students attending the University of Phoenix on the GI Bill, which is administered through the veterans agency. VA spokesman James Hutton said his department would work with the DOD and state agencies to evaluate the impact, if any, on GI Bill-approved schools. Hutton declined to comment about whether his agency is in the midst of an investigation of the University of Phoenix or is planning to launch one. In its statement, the VA invited veterans to visit its website to compare eligible institutions. But listings there for the University of Phoenix make no mention of the Defense Department’s action or of any open federal or state investigations of the school. In its letter to the university placing all of its campuses on probation, the Defense Department acknowledged an investigation by Reveal that showed how the university paid the military for exclusive access to bases – in violation of an executive order restricting access to only sanctioned education events – held recruitment events disguised as job-hunting workshops and improperly used military insignias on “challenge coins” handed out by recruiters. “Although the University of Phoenix has responded to these infractions with appropriate corrective action at this time, the frequency and scope of these previous violations of the DoD MOU (memorandum of understanding) is disconcerting,” Dawn Bilodeau, who leads the Pentagon’s voluntary education program, wrote in the letter. The Defense Department also cited separate investigations into the school’s marketing practices by California’s attorney general and the Federal Trade Commission. The SEC filing requires Apollo Education Group Inc., the University of Phoenix’s parent company, to hand over documents and other information dating back to Jan. 1, 2011, on “a broad spectrum of the business and practices” at the University of Phoenix, including its military recruitment methods. In another SEC filing, Apollo revealed in August that California’s attorney general launched an investigation and issued a subpoena seeking documents, including those related to the marketing and recruiting of military personnel since July 1, 2010. The filing said the attorney general was looking into the use of military logos and emblems in the university’s marketing, which generally is prohibited by the Pentagon. In response to Reveal’s questions about custom-engraved challenge coins handed out by recruiters, which featured logos of all military branches, the school said it had pulled them from circulation. Slottow said it was troubling that the Defense Department used the investigations by the FTC and California as part of its determination to place the university on probation. However, as Reveal disclosed in its coverage, those agreements were not made with the military’s education wing, but instead through branches that handle entertainment and other kinds of events. Participation in those events precludes recruitment of students, under President Barack Obama’s order, but Reveal showed through internal documents, interviews and undercover video that the university hosted those events with the specific intent to recruit. The university has 14 days to respond to the action. Defense officials then will determine whether to permanently bar the school from the tuition assistance program. Students who are currently enrolled at the University of Phoenix will be able to continue using military tuition assistance to finish their coursework, but new students will not be able to do so while the institution is on probation. Bobby Caina Calvan can be reached at bcalvan@gmail.com.